Men do not die easily…their work half done. But had they known for them the task was done. They fought and tried, but burst their hearts, yet no job was better done”. ‘If I die, I die in a good cause’, the haunting words of Thomas Ashe, spoken just prior to his death on hunger strike in 1917. Thomas Ashe packed much into his short life; school principal, active member of the Gaelic League, Commandant of the 5th Battalion of the Irish Volunteers in 1916, trade unionist, life sentence prisoner, President of the Supreme Council of the Irish Republican Brotherhood. Born in 1885 in Kinard east of Dingle, Co. Kerry, he was the seventh child of Gregory and Ellen Ashe, whose cottage on a hillside overlooked the inlet of Dingle Bay known as the “Traigh Beag.” Gregory Ashe farmed a small- holding which gave him the means to support his large family. In the course of time Thomas grew to manhood and by his short life and the manner of his death, he swayed the thoughts of the Irish nation. Around the glow of the turf fire on the hearth, the Ashe children would listen to their father recite verse after verse of poetry. From him they learned of the age and struggle of Ireland to be free. By the time of the 1916 Rising, Ashe had been appointed Commandant of the 5th Battalion of the Irish Volunteers in Fingal, North County Dublin. Despite the confusion caused by Eoin MacNeill’s infamous countermanding orders on Easter Sunday, the 5th Battalion turned out in force, with an estimated 120 Volunteers parading. With the Rising postponed until the following day, about half that number turned out on Easter Monday. This was one of the few districts outside of Dublin City where the Volunteers mobilized and despite having paltry munitions, they fought gallantly and inflicted serious casualties on British crown forces, adopting guerrilla tactics that were to prove so effective some years later. Ashe’s initial orders had been to disrupt communications and hamper the ability of the British to mobilize reinforcements into the capital. They set about their work with determination, blowing up railway lines and attacking RIC barracks. A number of Volunteers from the Battalion were summoned by James Connolly to support the Republican forces in the city, where they were detailed to both the GPO and the Mendicity Institute. The Battalion subsequently received a boost itself when it was joined by a small number of Volunteers from the Cabra Road in Phibsboro. These Volunteers had been forced to retreat north following a sustained attack from British artillery. This is the fifth day of the establishment of the Irish Republic, and the flag of our country still floats from the most important buildings in the country.....The men of north County Dublin are in the field, having occupied all the Police Barracks in the district, destroyed all the telegraph on the Great Northern Railway up to Dundalk, and are operating against the trains of the Midland and the Great Western……Courage boys we are winning…. Never had man or woman a cause, never was a cause more grandly served. Signed, James Connolly, Commandant General, Dublin Division. The ensuing Battle of Ashbourne is considered to be one of the most audacious engagements of Easter Week. The manner in which Ashe and the Battalion had sliced through enemy forces in the north County had forced the RIC to reinforce their base at Ashbourne. The Volunteers were not to be deterred. Despite being severely outnumbered and having come under surprise attack from almost 100 RIC men, who had arrived in haste from Slane, they maintained their discipline, defended their ground and ultimately put the RIC force to flight. The Barracks was captured and cleared of weapons. Ashe ordered the surviving RIC officers to return home but warned them of the peril of taking up arms against the Irish Republic. A dozen RIC men were killed at the Battle of Ashbourne. Two young Volunteers Thomas Rafferty and John Crennigan also lost their lives. 1917 marked resurgence in support for the Republican movement. Spurred on by the victory of Count Plunkett, father of executed leader Joseph Plunkett, in the North Roscommon by-election, Joe McGuinness, a prisoner in Lewes, was selected to contest the South Longford by-election in April. ‘Put him in to get him out!’ was the election slogan, and McGuinness scored a stunning victory. In June, the British government announced a general amnesty for the prisoners held in England. The remaining republican prisoners held since the Easter Rising, returned home to a tumultuous reception. The political conditions in Ireland had changed dramatically. In west Kerry bonfires blazed on the hills to welcome home local man Thomas Ashe who had fought so gallantly during Easter Week. He addressed huge crowds on the roads all the way to his home village of Kinard. ‘The body of Thomas Ashe lay in state in Dublin’s City Hall for two days and tens of thousands passed before it, many weeping, many angry, all sharing a new pride…The day came, and through Dublin passed a cortege the like of which had not been seen since the death of Parnell. Leading the marching host were Volunteers in full uniform, carrying rifles. There was a hush over the city at the daring of it. Everyone wondered would the challenge be accepted; would the troops suddenly bar the way of the Volunteers? The coffin was carried from the City Hall on the shoulders of Ashe’s comrades. Nearly two hundred priests in their white surplices, mayors and councillors in their red robes, fell in behind the mourners, and as they moved slowly away, the great contingents took their place in the procession from the neighbouring streets; teachers, labourers, athletes, football and hurling leagues, Sinn Féin clubs, Cumann na mBan, Foresters in their colourful uniforms, and many others. The slow beat of drums, the caoining of war pipes, the cry of funeral music filled the air. Soon one sound overcame them all: the beat of marching feet. The footpaths from the City Hall to Glasnevin were packed tight; the windows were crowded; every statue and vantage point on the way had its watchers, but it was the swing of the Volunteers, in brigades, battalions and companies, and of the 10,000 members of the Trade Unions, led by the Citizen Army, that dominated everything. The Volunteers had come from all over the country: Sligo, Donegal, Cork, everywhere. Kerry, Ashe’s county, sent 700 to mourn him. The Trade Unions represented every craft in Ireland, and at their head, in their uniforms, marched 1,000 men of the Postmen’s Federation. ….To the beat of muffled drums, the host of mourners slow-marched through the cemetery gates…..Clear into the air the trumpets flung the salute of the Last Post, and as the final note wavered into silence, there came sharp commands, and the three volleys were fired, to be echoed challengingly from near-by houses as every Volunteer stiffened at the sound of Irish arms being used again in Ireland’s name. The death of Thomas Ashe became one of the milestones in Ireland’s march to freedom. He and his comrades died in the certainty that the seed that they had sown would flourish. My cares in this world are few. The brother and son and sire. In the land of our Heart's desire! And I take on myself the blame. My spirit I offer to You. May be spared to Roisin Dubh. For the hopes of her future, Too! for the cause of Roisin Dubh. 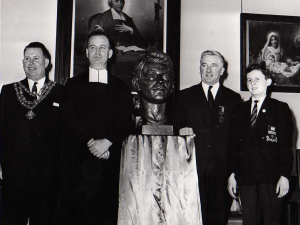 Every time you enter the Study Hall look at the bronze bust of Thomas Ashe remember what he did to make you free.